Based on reviews from 13 experts and 660 users. 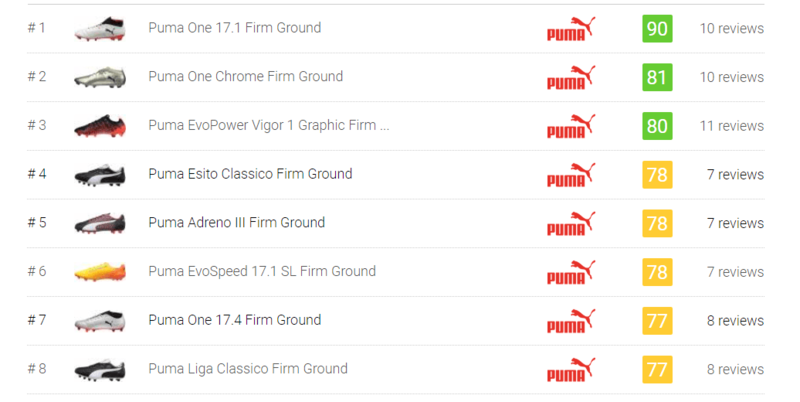 Learn how our rankings work or see our guide to Puma firm ground football boots. Updated Apr 2019. Being among the top brands when it comes to football boot manufacturing, Puma has always been keen on design and development, coming up with the most innovative products for the world’s fastest athletes. Their premium selection of Puma firm ground football boots proves to be among the best-performing boots in their category, showcasing unique features that take a player’s game to an entirely different level. Indeed, despite the ups and downs of its history of more than 60 years, Puma remains to be a strong contender in the football boot world. When it comes to the design and construction of Puma firm ground football boots, the brand has made sure that the best quality materials come into play to create the best performing boot there is. Looking closer at the brand’s firm ground archetype, here’s a low-down on what shoe enthusiasts might find. An exceptional ball touch alongside a lightweight and comfortable fit are what players look for in a shoe upper. Puma had definitely put these into consideration when it came to the design of their Puma firm ground football boots. Among the materials that the brand utilizes for their uppers include full grain leather, knit, and synthetic leathers. If there is one thing players appreciate most about Puma firm ground football boots, it’s the fit. The brand is known to produce boots that offer a broader width to accommodate those with wider feet. However, even with the wider fit, their cleats allow for a natural movement of the feet that enhances ball handling. For their Puma firm ground football boot releases, the brand’s standard includes an efficient combination of bladed and conical studs. Bladed cleats work well in enhancing acceleration while the conical ones enable easy circular motions. The configuration is complemented with lightweight durability and flexibility, so players perform with perfect stability on the pitch. Recent outsole innovations developed by the brand further boost the performance of their Puma firm ground football boots. Among these are the RAPIDAGILITY soleplate and the RAPIDSPRINT Pebax outsole featured in the Puma One series. The typical Puma firm ground football boot utilizes a cushioned EVA foam for its midsole. This compound offers shock-absorbing properties that relieve pressure on the feet, minimizing fatigue. The cushioning provided by this midsole also gives the needed protection for the foot. It also optimizes the fit, so wearers get a more comfortable experience with their boots. Among the brand’s latest set of Puma firm ground football boots is the Puma One series. This line is engineered from the ground up to dominate the game with explosive speed, lethal finishing, and unparalleled accuracy. Puma boasts of this collection being everything a player needs to own the pitch. Set to replace the former EvoSpeed and EvoTouch silos, boots from this batch feature a new, bolder design that puts a premium on fit, feel, and acceleration. With a pair of these cleats on the pitch, wearers will not only look the part but be equipped with everything they need to excel on the playground. The first ever Puma firm ground football boot from this series highlights a modern construction with full grain Kangaroo leather around the vamp. It also features a strengthened heel minus a leather cover to add stability and protection. Inspired by its evoTouch roots, it wears a heightened evoKnit collar for a secure and stable fit. This Puma firm ground football boot silo is meant to cater to players who rely on their instincts and unpredictability to push the game forward. With its earliest release already tagged among the best boots of 2018, the Puma Future surely has the potential to outperform its predecessors and change the course of the game. Boots from this Puma firm ground football boot collection showcase remarkable looks set in a smart combination of hues and patterns. They are designed to fit snugly on the feet for a personalized fit. One of the unique features of this series is the revolutionary FG/AG (Firm Ground/Artificial Grass) stud pattern that can be seen in the Puma Future 18.1. With these hybrid cleats, users will have no problem accelerating through natural grass or artificial grass. As its name implies, this silo consists of Puma’s trusty speed boots. Although already an outgoing Puma firm ground football boot collection replaced by the Puma One, the EvoSpeed is still a name to be reckoned with, having produced a number of the brand’s best firm ground boots, including the EvoSpeed 4.4. In fact, the silo has already established itself as one of the best options on the field. The standard EvoSpeed football boot showcases a construction built for maximum speed and agility. Being a speed boot, it features an impressively lightweight design alongside a stable and comfortable fit. If the EvoSpeed promises momentum, the EvoPower silo boasts of providing power and accuracy. Its design concept focuses on producing a superior feel of the ball, so players are able to maneuver the ball better and perform with enhanced shot velocity and precision. At the time of its release, it was termed the most advanced power boot to date. The EvoPower 1, the collection’s first release, replaced the earlier PowerCat model from the brand. Puma is one innovative genius that constantly strives to outdo itself. As one of the leading companies in terms of product design and development, it comes as no surprise that their firm ground football boots showcase their new advancements meant to boost a boot’s performance. Here are a few of the latest technologies used in their Puma firm ground football boots. This outsole innovation consists of a lightweight and highly reactive base meant to enable quick changes in movement. It utilizes a high traction combo of strategically-positioned conical and bladed studs that deliver exceptional traction on natural grass. This feature can be seen on the most recent Puma firm ground football boots of 2018, including the Puma Future 18.1 and the Puma One 18.1. This cushioning system is located underneath the surface of the upper of Puma firm ground football boots. It works to eliminate any stiffness around the upper, allowing its material to mold around the contour of the foot. The foam gives a soft and squishy feel that cushions the foot during contact with the ball. It also serves as a rubber rebound during striking movements. This innovation is featured in the Puma EvoPower 1.3. This upper technology utilizes a Japanese synthetic that can stretch vertically from the toe. This one-way stretch allows the upper to flex with the foot for a barefoot-like kicking experience. It also helps give the needed stability, especially when making lateral movements during twists and turns. This feature is installed in the Puma EvoSpeed firm ground boots. Aligned with the vision of creating fast Puma firm ground football boots, this innovation works to reduce the overall weight of the shoe. It also uses a stud configuration engineered to facilitate swift movements to produce a more agile boot. A boot that showcases this technology is the Puma One 18.4. This feature was initially seen on running shoes but has now made its way to the football world. The Netfit is an innovative upper application that helps enhance the overall fit and feel of a Puma firm ground football boot. It consists of a unique lacing system with multiple lacing options, giving wearers the option of customization in the fit. The Puma One and Puma Future boots utilize this technology in their models. 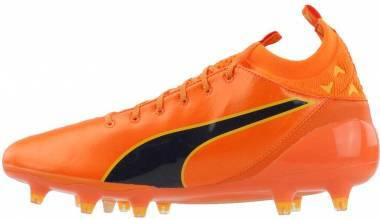 What is the most lightweight Puma firm ground football boot? The Puma EvoSpeed SL FG is arguably the lightest Puma firm ground football boot, weighing just 103 grams or 3.6 ounces. Made for speed, it features an ultra-thin textile upper that provides a barefoot feel of the ball while also reducing the overall weight of the boot. It also employs Puma’s SpeedFrame system and Speedtrack spines meant to boost performance on the field. Moreover, its durable and featherweight soleplate allow for quick turns and cuts on natural grass pitches. What Puma firm ground football boot works best for both narrow and wide feet? Puma is a brand known to create wider-fitting boots that accommodate feet with broader width. However, with their latest Puma firm ground football boot release of 2018, no longer will width become an issue. The Puma Future 18.1 has been fitted with a unique lacing system called the Netfit, which allows for a customizable fit. This feature was originally employed in running sneakers but was later adapted in the design of their Puma firm ground football boots. Whether a player has wide or narrow, they can expect to get a snug wrap around the foot and even adjust the tension of the laces to their preferred tightness.